At the Boat Museum in Ellesmere Port was the nice red and white Big Top circus tent. You could see it from the motorway, and the signs were all lit up! So you couldn’t miss it really. 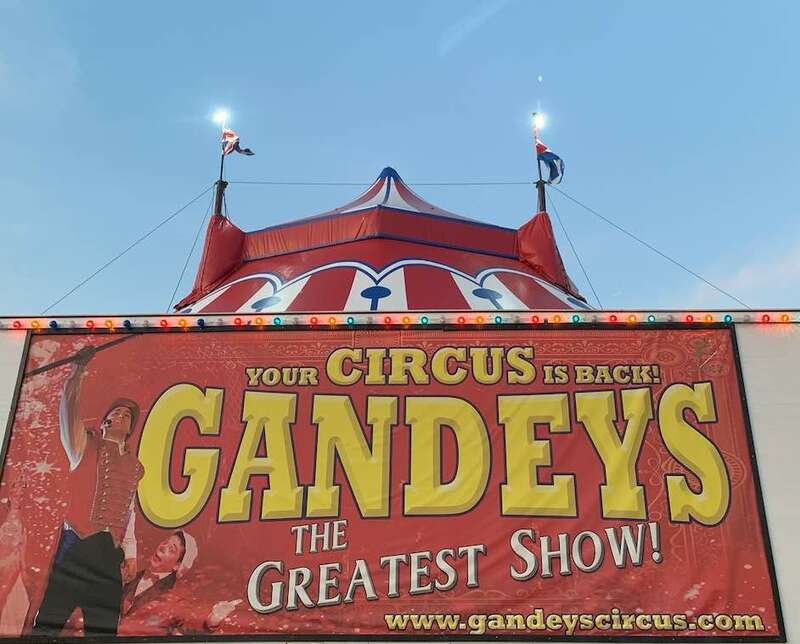 The location of Gandeys Big Top Circus changes every week, so where it is doesn’t really matter. It’s the show that you want to know about. The Big Top tent is heated and I didn’t realise just how warm it was until we left!! It was so nice and cosy which makes it 100 times easier to enjoy the show. Tickets are available from the on site box office (at every location), and the prices vary depending on where you would like to sit. It is worth noting that it doesn’t matter where you sit, you might be chosen for some audience participation by Chico Rico (the clown). With production numbers inspired by the glamour and glitz of West End musicals, featuring over 200 lavish costumes in our new fully-heated Italian big top theatre of wishes and dreams… you’ve never seen anything like it! I don’t want to spoil the fun for anyone who wants to go and see the show so I won’t mention everything that happens, however there wasn’t a moment that we didn’t enjoy. There are plenty of acts that will keep you on the edge of your seat, one of my personal favourites is the tightrope. Especially when you have 3 artists walking on the tightrope, two of them have a bar strapped to their shoulders and the third artist is stood on that bar! Well I think I held my breath till they were safe on the platform. Another act that we both enjoyed was ‘The Rubber Man’, as the name suggests he is a contortionist. Honestly just watching him move into different positions made my body ache, I didn’t know the human body could bend into any of those positions… Especially not comfortably. In between acts, Chico Rico comes out to entertain the crowd and gets everyone involved. During one of the act changes Chico Rico came out and put on ‘baby shark’, I’m not normally bothered by things like this but it was fun seeing all the adults joining in and having fun (yes I joined in with the actions and enjoyed myself). 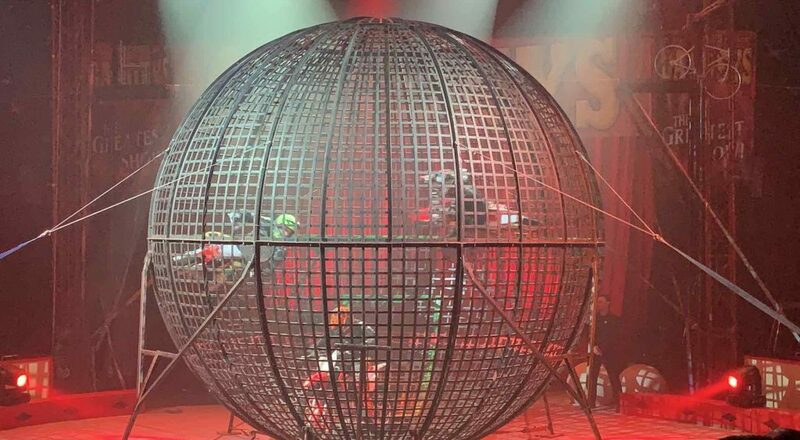 The last act of the show is definitely the best, ‘adrenaline-fuelled antics in the space wheel, and three motorbikes in the ‘globe of death’.’ So I have to say you really must trust the other bikers in the globe AND have excellent coordination for this. I couldn’t look away and couldn’t help but admire how three bikes could fit in the ball let alone drive around it together! If there’s any act not to miss it is 100% this one. This show is wonderful for children and adults alike as there is so much to watch, there is a lot of interactivity but the whole show is fun. We posted a lot on our Instagram page while we were there, so if you want to see some more photos then check out our ‘circus’ highlights. Previous Previous post: Alton Towers on Opening Day!